Locate saves names of all files in your hard drives to file database. After that you can locate files. This program works like updatedb and locate in Unix systems. Win32 based locating program also included. I wonder why they do not show any new version except 2012 on the home page? on windows XP 32-bit i get "is not a valid Win32 application". And, no, i am not the author. "extremely well", if you have an NTFS system, and are looking for filename-search only, I recommend "Everything search engine"
Very nice, but it doesn't appear to be able to find networked file. And THAT is a killer for me. My music database - which is what I use Locate for - is spread over three machines. I like Locate, and can deal with the lack of real-time updating, as I don't add that much to my music library each day. It does crash occasionally on my 64 bit W7 machine. I just restart it. No big deal! The interface and options are wonderful, but this application has a fatal flaw at its core: It does not work in real time; it relies on repetitive indexing. I set mine to index every 3 minutes (yes, every 3 minutes! ), and still had issues with Locate finding files that didn't exist, or not finding files that did exist. I also had several crashes with Locate. Regardless of which version I chose to use. In short, it's a lousy approach. 1 star for being unusable. Everything does not work at all on Vista. Also....how is something like this supposed to work(fast & immediate) if it does not index? "extremely well", if you have an NTFS system, and are looking for filename-search only, I recommend "Everything search engine" ( http://www.voidtools.com/ ). That being said, I've tried Locate, and it is quite competent, but I like Everything better -- as I too, search for filenames mostly, and I do not like the out-of-date-database problem nor always-on indexing programs. 4 stars for a well-deserving application. No real-time indexing of newly added files. Still a deal breaker. This is the kind of searching that should be in embedded Windows Vista. 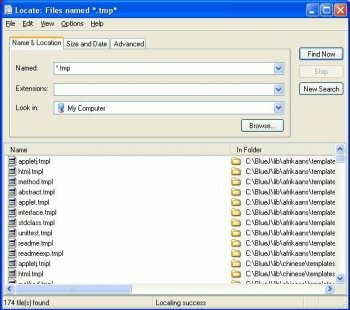 The advanced search option in Vista is NOT very handy if have a large amount of files, and/or multiple hard drives connected to your PC. With Locate you can choose the exact settings that works best for YOU, and it's extremely fast. I have over 1 million files, and when the search database is updated, it finds whatever you want in 1-2 seconds. Locate doesn't looks as good as Vista, but it's very clever for it's purpose, and the more you use it the more you'll realize how limited the standard Windows search really are! I use Locate for my every day use at work and at home! Can't the Reviewer:	extremely well be silenced? His regularly repeated, annoying spam messages give the impression, the software he endorses was for morons only. Avafind isn't that bad! I've tried it in the past but it is, as others pointed out, a dead project and doesn't have the search power and flexibility of Locate, which serves me much better. and Locate serves me better and I prefer it by quite a margin but prefer locate, which serves me better. I actually like to be able to determine myself when to update the database, and that it enables me to also find files that may have been deleted. For this reason, and because I don't want to always have the indexing engine run in the background, I see real time indexing as a disadvantage, if anything. In the very rare cases an up-to-the minute database is required, on can always quickly update the database which hardly takes time, no problem. Definitely not a catastrophe worth switching to capital letters about. Awww God, this is getting old. 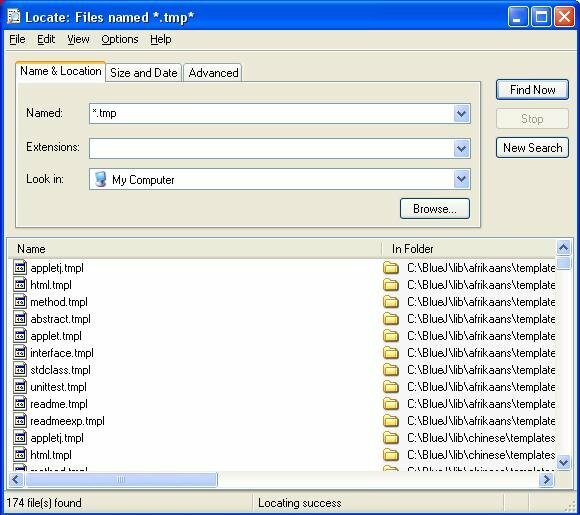 No real-time indexing for a file-finding app is the absolute most retarded decision anyone can make in 2008. It was OK for Unix in the 70's..., but jeez, I think we've advanced slightly since then. If mankind did NOT create Ava Find I would personally use Google Desktop/Copernic or some other full-content indexer and CASTRATE IT to only index FILENAMES - NO CONTENT, just as long as it gives me REAL TIME RESULTS FOR MY SEARCHES. If you're a heavy IT worker, you WILL generate lots of content on an hourly basis. I started with Locate went to Ava Find(for more than a year) and now am back to Locate. Cos AF is a dead app, and DOES crash sometimes AND its not configurable in any way, so Locate wins for me. This app rocks. Yes the real-time indexing is a nice feature in AF, but not indispensable. It takes maybe 30-60 seconds to update my +2tb every other day or so. And it takes a second or two to start, already showing what I searched for, and then it's not already running in the background when I start it (I use a runbox replacement with a couple of aliases that parse switches along with what I'm searching for). As for the AvaFind spam, I'm sure it's a great app, but I wouldn't know what to use real time indexing for, I at least have no use for it. And having apps running all the time in the background is something I try to avoid in general. But if you need that, for whatever reason, go ahead and buy it, or some similar app. I don't need real-time indexing. Updating the database once a day or so is good enough for me. Then it finds all the relative files extremely fast, just what I need. It's not like I need to search my files every day. Speed is very impressive so it's getting a five from me.